Combining the relaxed ambiance of a Southern California beachside resort with sophisticated wedding spaces, the Hyatt Regency Newport Beach provides a beautiful backdrop to stage your nuptials. From getting ready in one of their light-filled, courtyard facing suites, to dancing into the night in one of the elegant ballrooms, everything can happen in one location when you choose to have your wedding day at the Hyatt Regency Newport Beach. Ceremonies can be held in their outstanding Back Bay Amphitheater, with the capacity to hold up to 1,000 guests. 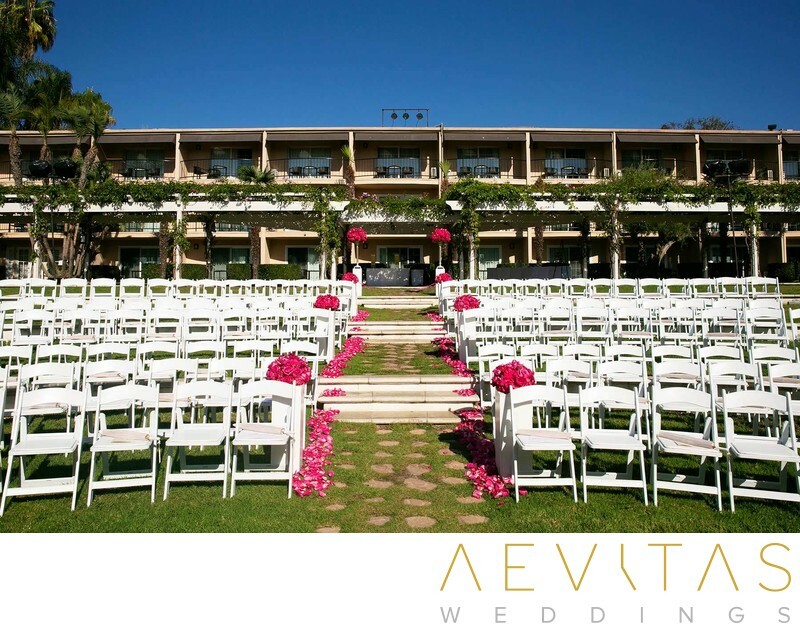 Overlooking the bay at Newport Beach, it is surrounded by lush, tropical greenery and reached through a bougainvillea-draped white trellis. While you and your loved one stand hand-in-hand on an elevated terrace, your family and friends can watch you exchange vows from tiered seating above. For more intimate wedding ceremonies you can opt for the Plaza Arbor with its adjacent Plaza Ballroom or the Oasis Courtyard which has been recently renovated. The Garden Rooms are ideal for cosy wedding celebrations of less than 100 people, with French doors inviting the garden inside and fireplaces creating a warm ambiance. All of the reception spaces at the Hyatt Regency Newport Beach offer both indoor and outdoor spaces, with the lavish Plaza Ballroom the largest venue on offer. The adjacent patio can be used for cocktail hour, with roller windows providing protection during unfavorable weather. The Terrace Room provides a more intimate setting, with expansive glass windows overlooking Newport’s Back Bay and an adjacent courtyard with pool. The stunning Rose Garden can also be used for wedding ceremonies of up to 50 guests, or used as a backdrop during couple portrait sessions throughout the Hyatt Regency Newport Beach’s 26 acre property. All catering and beverage packages are provided on-site by the expert event team at the Hyatt Regency Newport Beach. A personal wedding specialist will handle all the logistics and coordination of your special day, ensuring ease of planning and allowing you to just relax and enjoy each and every moment. At the end of the night, you and your guests can retire to one of the Hyatt Regency Newport Beach’s rooms or suites, with three pools and a golf course to keep you entertained for an indulgent wedding long weekend.